You can also go to the index, look for the entry “New in Mahara 16.04” and then explore the features from there. You can display videos and audio files uploaded to Mahara now also on mobile devices. Mahara does not depend on a Flash media player anymore, but uses HTML5 technology fot it. For desktop, you can also embed oga audio files and ogv video files. Find out more. You can select your tags easily by auto-completing what you type. If a tag exists, you see it bubble up in the tag selector the more you type. If it doesn’t exist, finish typing and press the Enter key or select the word that is highlighted as you typed. Find out more. 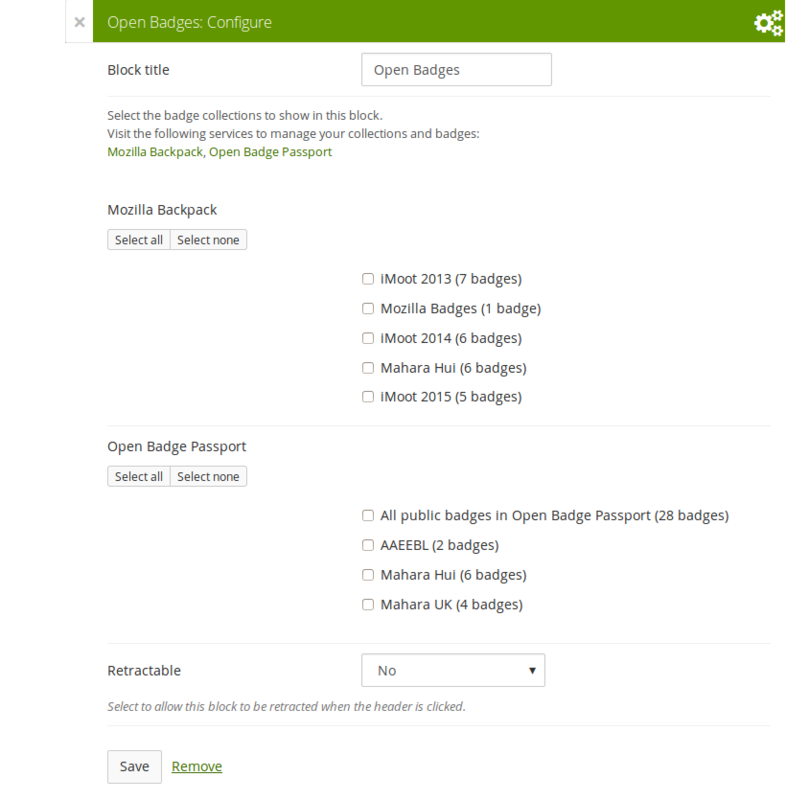 You can display your Open Badges on your portfolio pages. First, create public collections of the badges you would like to display from your Mozilla Backpack or the Open Badge Passport. Then you can choose them from the block configuration. This is what the block can look like on your portfolio page. If you use the “Wall” block on your profile page, people can post messages for you there. You receive these now in your Mahara inbox or via email if you configured these types of messages to be sent as email. The site administrator can decide what the comment ratings should look like and how big the rating scale is. There is a choice between 4 icons: . The site administrator can also choose the colour for the final icon. Find out more. Setting up the comment ratings. You can embed content from many different websites without having to ask the site administrator to approve the iframe code. Use the “External media” block to add Embedly code. 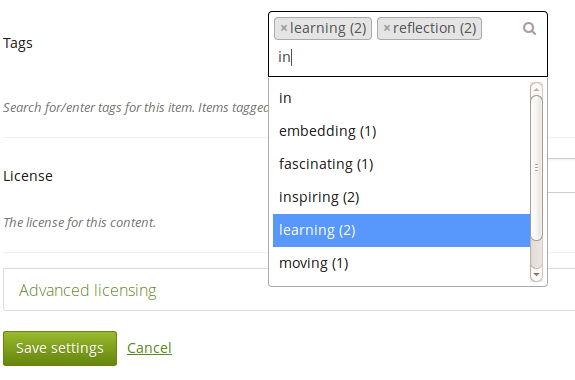 The Embedly plugin for Mahara has been popular for many years. 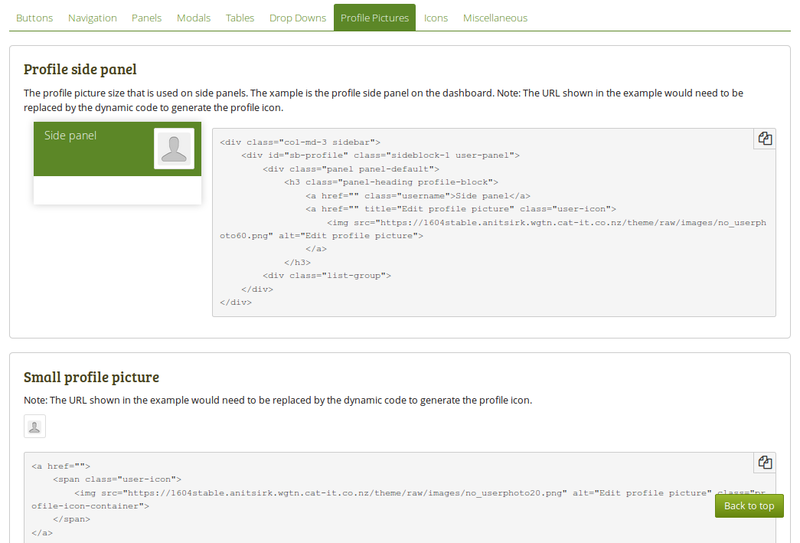 Its functionality is now integrated into Mahara so that no plugin needs to be installed anymore. In Mahara 15.10 journals for groups, institutions and the entire site were introduced. Now you can also use the “Recent journal entries” block to display recent journal entries in a block on a group, institution or site page. The style guide is a tool for developers. It allows you to see how visual elemens render on a page, and what they look like in different themes. When you want to build your own Mahara functionality, you can refer to the style guide for the way tables are created, what a navigation should look like, what buttons are used and so on. Find out more. Screenshot of the style guide displaying the “Default” theme.